* Currencies include: US dollar, Canadian dollar, Australian dollar, New Zealand dollar, British pound, Euro (Austria, Belgium, Netherlands, France, Germany, Greece, Ireland, Italy, Portugal, Spain), Swiss franc, Swedish krona, Russian ruble, Japanese yen, South African rand. 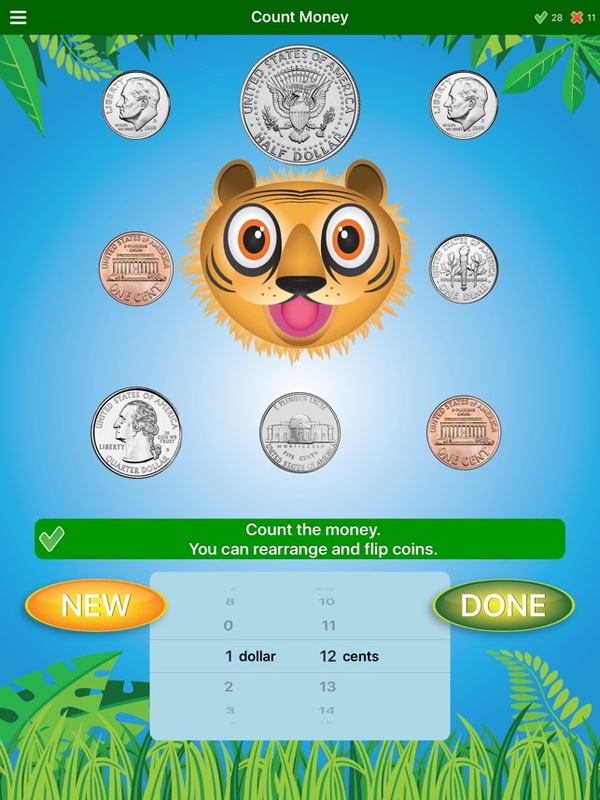 Jungle Coins is an engaging, easy to use educational app that teaches kids coin math in multiple languages. For iPad only. Misprint on back on The new Dollar coin . Hope / Glad it's not in circalation yet. This App has a lot of nice features that Asa teacher I can really appreciate. 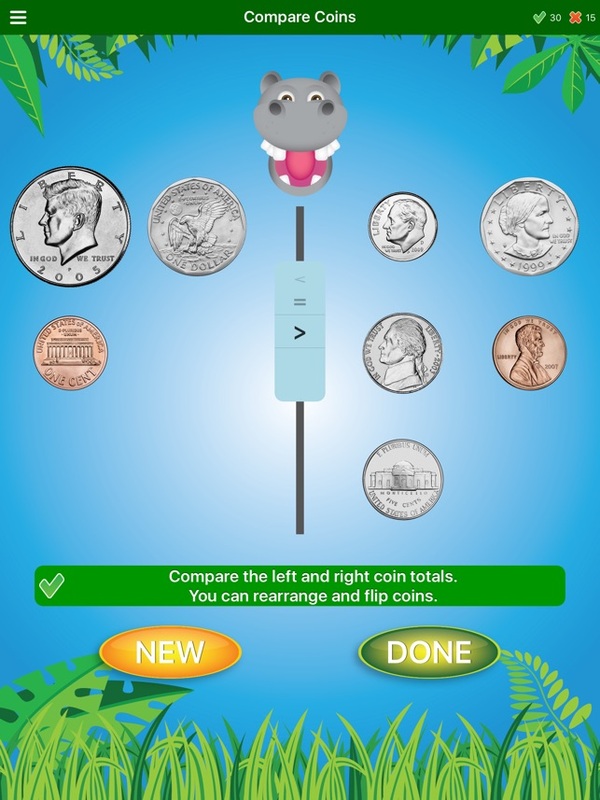 I like the ability to customize activity levels, learn the coins etc. I like that it keeps data on accuracy. You can turn off features you do not want such as sounds. To move to the next question you have to shake the device. If there was a way to disable this and touch a button to go to the next question or have it automatically change once your answer has been checked I would rate the app even higher. Call me picky but I do nor want students shaking my iPad as they might sling it instead. 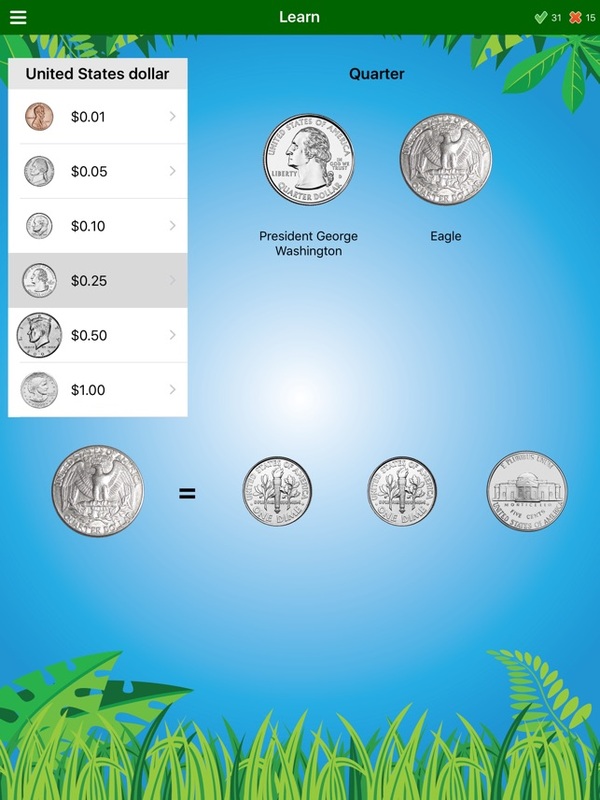 This app does a great job of teaching children all about coins. 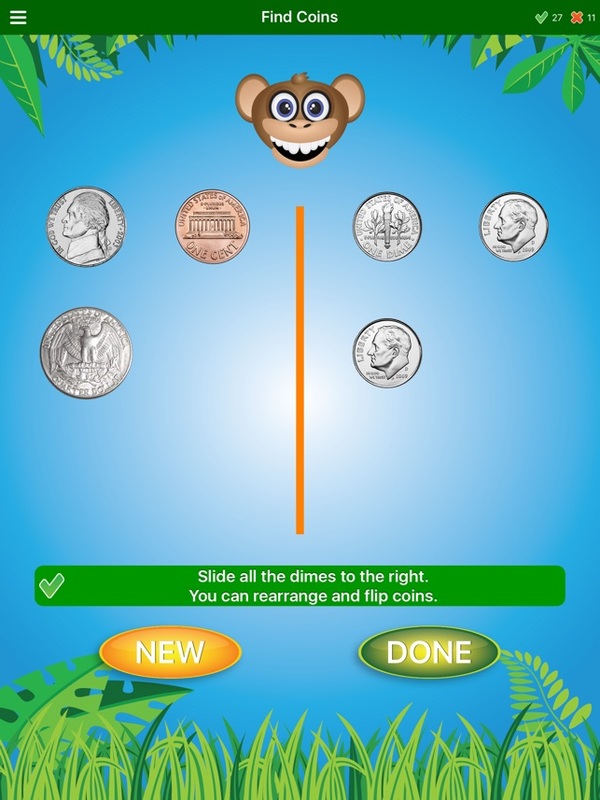 Options are for learning coin names and values, identify, add, make change are excellent. 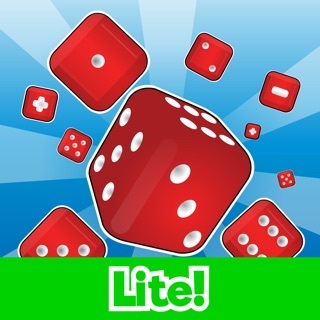 Adult options include edit coin combinations per level, choice of currency, difficulty options. 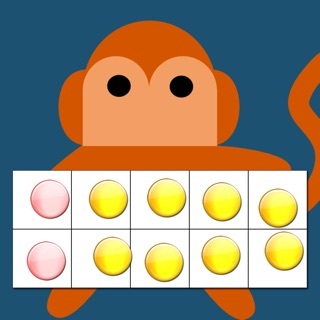 Graphics, actions, and sounds are engaging for children. I've found that my students are interested in receiving the in app praise and rewards. Students stamina using this app has increased from needing to work side by side with adult and strong guidance to ability to use app independently away from adult. The app is very easy for adults and children to navigate. The set up is self explanatory and easy to set up for many students. 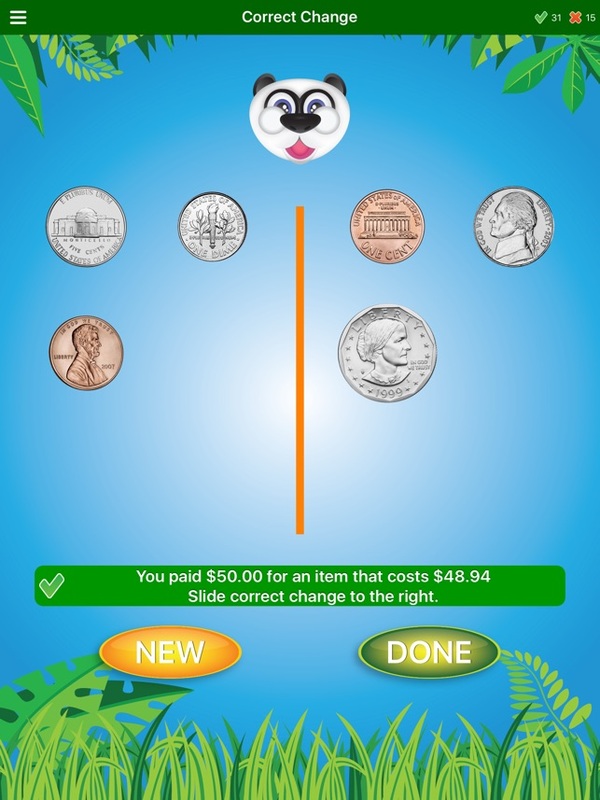 Students are easily able to move through the app without difficulty once shown how it works. 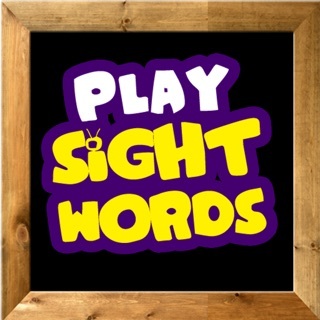 I highly recommend this app to parents and teachers. It is inexpensive and highly effective.